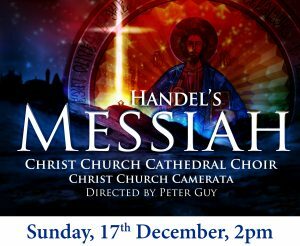 Christ Church Cathedral Choir presents Handel’s Messiah on Sunday 17 December at 2pm. The work is brought to life by the Cathedral Choir, Christ Church Camerata and soloists Kathleen Moore (soprano), Kathryn Dries (mezzo), Blake Parham (tenor) and Josh Salter (bass), directed by Peter Guy. Booking your tickets online is highly recommended (but tickets are available at the door). Click here to book your tickets NOW! This entry was posted in Music, News on December 4, 2017 by admin.